As you're looking at the routes, keep in mind that there are LOTS of ways to get around the eastern end of the San Bernardino Valley. Out of towners or locals that aren't familiar with the trails on this route are highly encouraged to look it over and wrap their head around the different portions of it. To assist with that, shown below are two of the options available on the route to get you back to Redlands if things just aren't working out as planned. 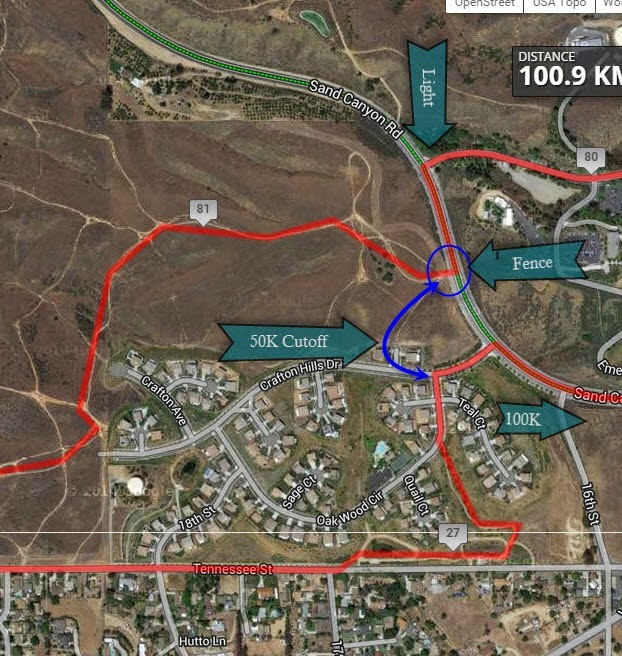 Sand Canyon: The two routes share the same course up to mile 17/27.5km. 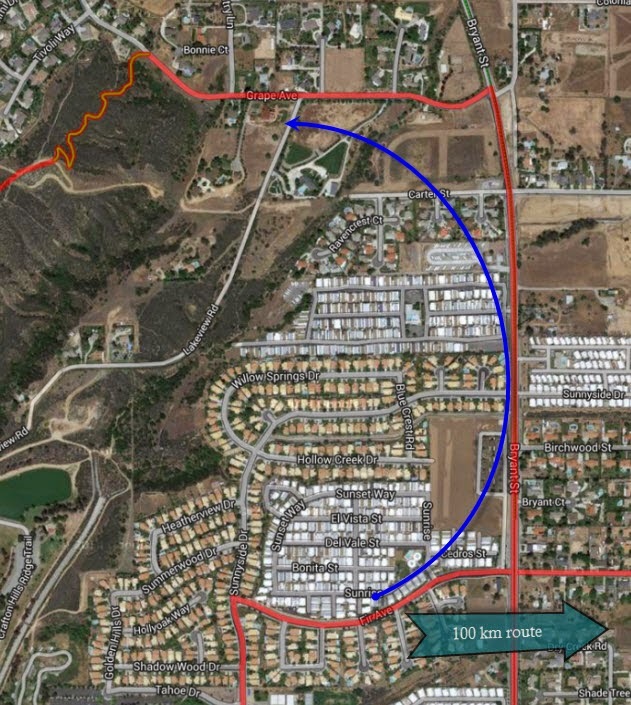 At that point, the 100 km continues east into Yucaipa proper, while the 50 heads back west to Redlands. The 100km riders who are looking for an early exit can simply follow the 50km route at this point. Bryant St: If you want something a little bit more, and are feeling decent but not quite good enough to finish, hang in there till the next alt-option at the 22.3 mile/36km mark. The 100km route at this point heads east on Fir Ave (and you should stay on it!!! ), but if you want to go north on Bryant, and then over to Grape St, you'll still be able to do all the Crafton Hills portion. That keeps you on the rest of the route and lets you finish with everyone else. That is highly encouraged! There are lots of other ways to bail if you have to, but these are the two big options to help you finish the ride, rather than just getting back to your car. The goal is to have fun, see some new territory, and enjoy the day. If you're miserable during the ride, you're not doing any of the above. Get back to Redlands and have lunch already!!! Used your route sheet to tabulate the trail miles. I added up to about 16 miles. That is not half!! :) but my legs and behind will appreciate that. It'll all work out, good times! Two Weeks To Go. Now With Lunch Included!